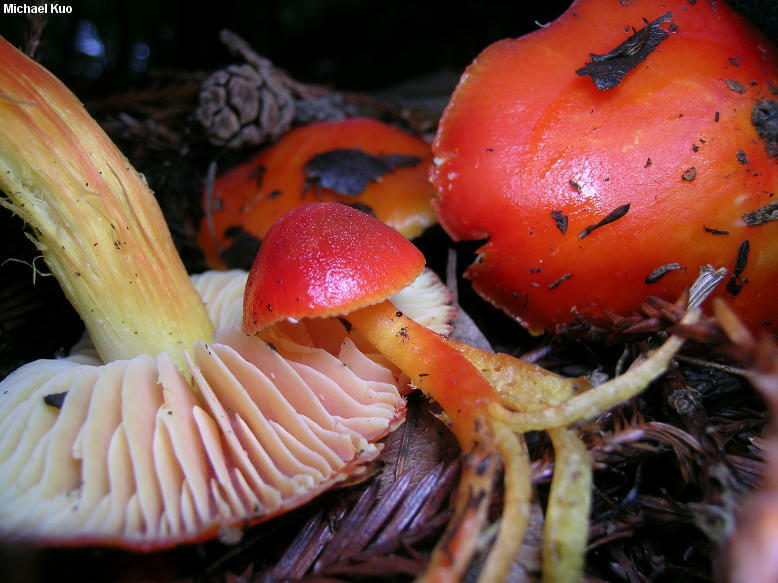 Hygrocybe punicea is probably the largest common species of Hygrocybe in North America, and this fact alone will help to separate it from the many smaller red and orange species. 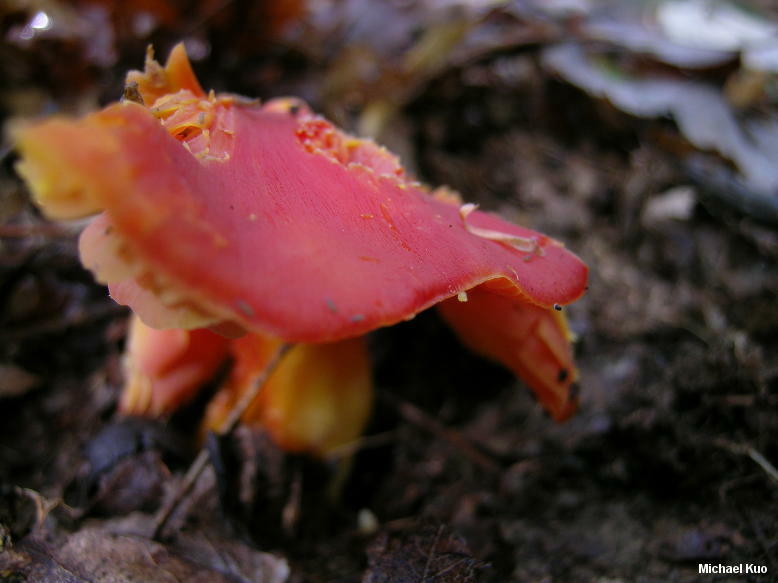 Additional distinguishing features include the dark red, greasy cap; the narrowly attached gills; and the stringy stem. The cap may be more or less convex when young, but it soon expands to broadly bell-shaped or bluntly conical. The stem is stringy enough that it soon begins to split. 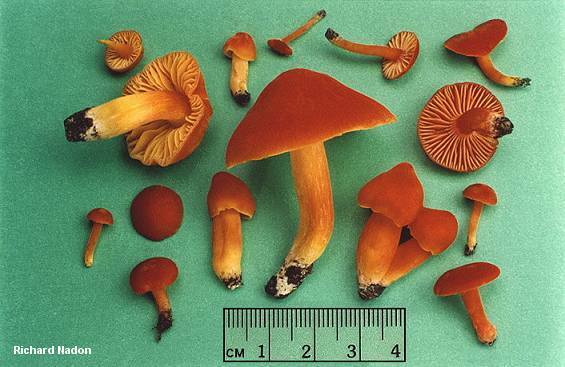 If you'd like to spend many hours examining the thickness of your specimen's pileipellis and the dimensions of its spores, assessing whether its stem base is white or yellow, and figuring out the precise extent to which its gills are attached to the stem, I invite you to consider other species names for your big red waxy cap--including Hygrocybe coccinea, Hygrocybe splendissima, and Hygrocybe aurantiosplendens. I'm sure you're chomping at the bit, but before we open the gates let me mention that this race track takes a sharp turn and heads for the Outdated Morphospecies Glue Factory. 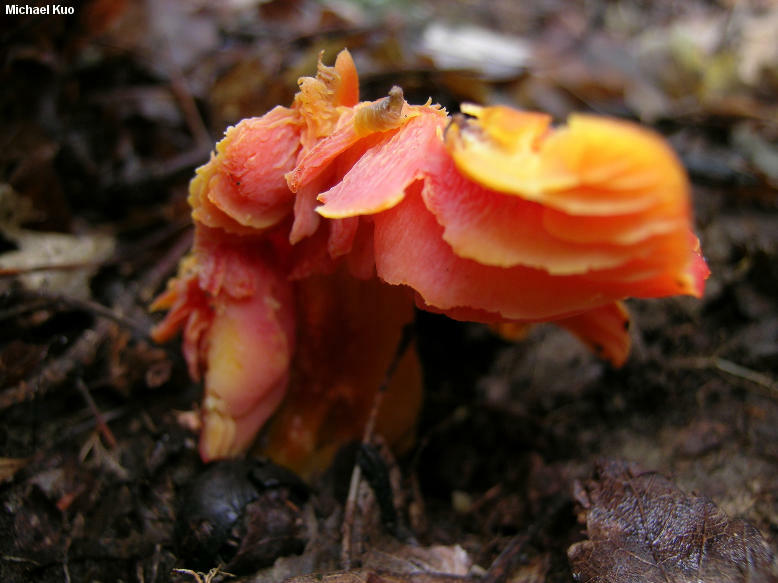 You will be much happier munching Hygrocybe punicea in a nice, quiet meadow somewhere while mycologists await ecology- and DNA-based studies. Hygrophorus puniceus is a synonym. Ecology: Precise ecological role uncertain (see Lodge and collaborators, 2013); often appearing under coast redwood on the West Coast, and under beech and hemlock in eastern North America; growing scattered or gregariously; summer and fall, or over winter in warmer climates; apparently widely distributed in North America. The illustrated collections are from California, Kentucky, and Québec. Cap: 2-10 cm; broadly convex, soon expanding to broadly bell-shaped or bluntly conical (or eventually more or less flat); greasy when fresh; smooth and bald, but very finely rugged when viewed with a hand lens; dark red to dark reddish orange, fading to orangish red or orange; often splitting radially with age. Gills: Narrowly attached to the stem, sometimes by means of a notch; distant or nearly so; thick and waxy; pale yellow to reddish or orange. Stem: 4-12 cm long; up to 2 cm thick; equal or slightly tapering at either end; dry; usually "stringy" (soon splitting and becoming finely fibrillose); yellow to orange; often with a whitish base. Flesh: Thin; yellowish, or whitish near the center. 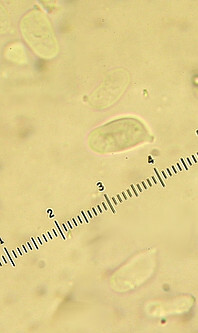 Microscopic Features: Spores 8-10.5 x 4-5.5 µ; smooth; more or less ellipsoid; hyaline in KOH; inamyloid. Hymenial cystidia absent. Lamellar trama parallel. Pileipellis an ixotrichoderm. REFERENCES: (Fries, 1821) Kummer, 1871. (Saccardo, 1887; Kauffman, 1918; Hesler and Smith, 1963; Bird & Grund, 1979; Largent, 1985; Arora, 1986; Barron, 1999; Boertmann, 2000; Roody, 2003; McNeil, 2006; Lodge et al., 2013; Kuo & Methven, 2014.) Herb. Kuo 01130504, 01160501, 10150400.